Paul Stassen (from TULiPPS) sent all partners in the consortium an invitation for the “Energiebeurs” in de Brabanthallen in Den Bosch. 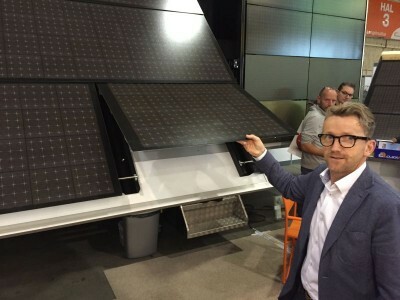 I went to see how the concept is accepted by the Dutch Solar industry. I quickly walked through the halls, nothing really exciting to see, until I got to the TULiPPS/SUMMIT booth. For most of the time I just stood there and couldn’t move because of all the visitors the booth got. I must have spoken to 50-70 people, and so did Eugene Widlak, Stan Verbraak, Paul Stassen, John van Laarhoven from TULiPPS. 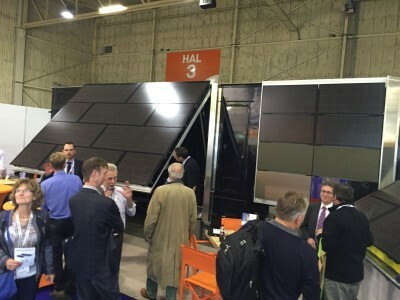 Also the people from Eurotron (Jan Bakker, Bart de Gier) and IBC (Ronald Jaspar) joined the team, and all of us were talking to people who were interested in the SUMMIT-modules on display. 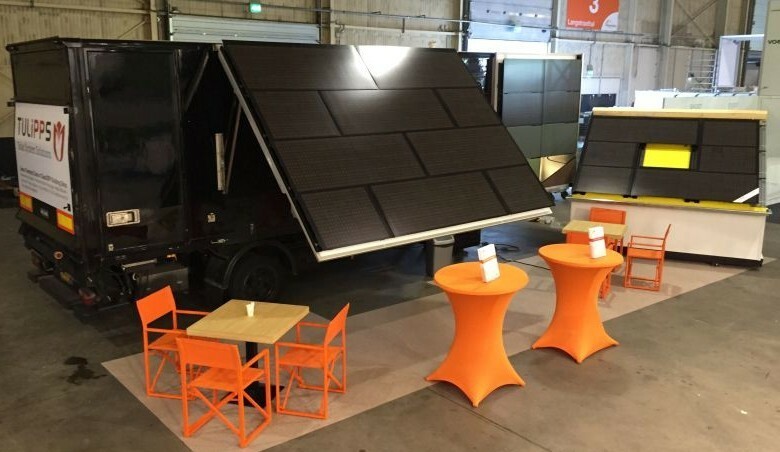 The booth comprised of the truck, with a pitched roof and a façade, and a stand-alone wooden construction with a pitched roof and an integrated window from Fakro). Everybody agreed that the module is good looking. Much better looking than the standard blue, framed modules with those ugly ribbons running on the front side of it. Black, thin, frameless and with back-contact technology, the SUMMIT-module is very suitable to fill a roof with, and replace your standard roofing tiles. 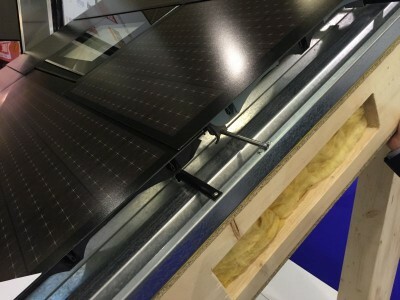 Many felt this module was suited for both newly built houses and renovation projects. The main “concern” was the waterproofing of the roof. We showed the option with the big “gutter rail” underneath the spacing between two modules, and the roof with the Fakro window where an EPDM foil was used to waterproof the roof. I mentioned the alternative option of a small gutter placed directly under the spacing. 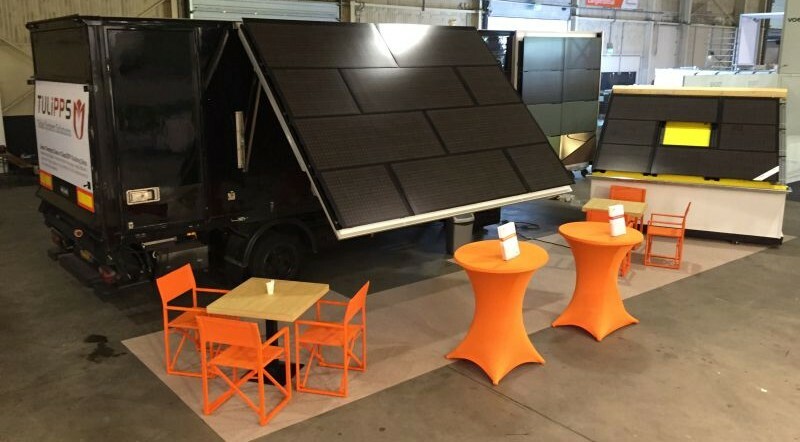 People were impressed by the flexibility of the system (the pitched roof on the truck exists of two sizes modules). They wanted to know if we use special electronics for that (“optimizers)”: yes we do. 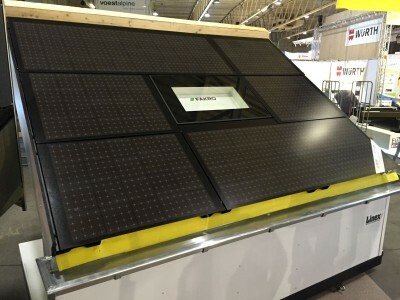 For BIPV in renovation you probably need dummy modules in various sizes (“passtukken” in Dutch). People liked the fact that you can choose alternate colours. There were quite some questions about price and availability. I explained that we are not producing on a commercial level yet and are targeting more demonstration projects with building companies around mid 2016. Real eye-catchers. Of course everybody wanted to volunteer their roof, but who wouldn’t, eh? The COSMOS design draws a lot of attention; it stands out as being “a good looking module”. The SUMMIT consortium now faces the challenge to pick the right demonstration projects.